L.I.F.E. Arts is 501(c)(3) non profit that provides artistic resources, opportunities, mentoring and positive experiences to help students develop the qualities and skills they need to live up to their God-given potential. We believe that through the leadership skills and discipline of the arts, the youth of St. Louis can be a driving force, modeling the change that we all so desperately desire to see manifest. In order to achieve this goal it is of the utmost importance that students living in underserved communities have access to consistent and localized programs, experiences and infrastructure. A community so rich in artistic talent should also have adequate facilities and resources. Maryville University has selected L.I.F.E. 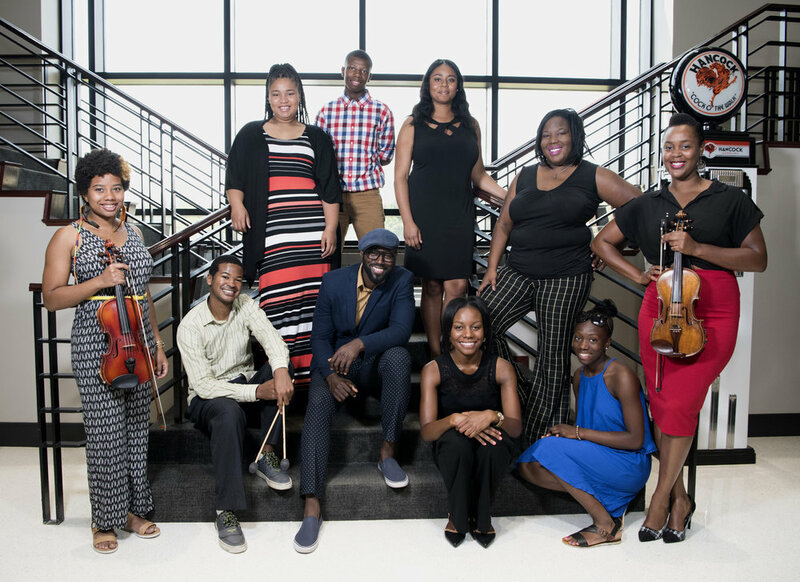 Arts, an organization founded by soul singer, songwriter, producer and community advocate Brian Owens, as the recipient of a $100,000 grant that will be awarded over the next two years. Focused on leadership, innovation, faith, and excellence, L.I.F.E. Arts provides artistic resources, opportunities, mentoring, and positive experiences to help students develop the qualities and skills they need to live up to their God-given potential. In partnership with the St. Louis Cardinals, LIFE Arts and St. Louis composer Adam Maness teamed up to create a song in honor of the extraordinary life story of Bob Gibson. Maness and Owens worked with Compositions for L.I.F.E. students wrote and performed the lyrics of the #Complete Gamer song using Bob Gibson's 1968 autobiography "From Ghetto to Glory" as their source of inspiration. Throughout the season as the Cardinals honor Bob Gibson with the #Complete Gamer campaign, they will be raising money in his name through their charitable foundation Cardinals Care to help fund Compositions for L.I.F.E. Compositions For LIFE Therapeutic Songwriting is a one-on-one mentoring program for middle and high school students (grades 6 – 12). Students of the his program participate in therapeutic songwriting sessions with music therapy students from Maryville University to compose original songs that focus on the student’s mental and emotional well-being. Students are then given the opportunity to write and professionally record their own songs. This approach gives each student the time, attention, resources and encouragement to accomplish the task. More importantly, it is the overall goal that the students learn more about who they are and become empowered to be leaders in our world today. Over the years we have discovered that no one makes it on their own. It takes a community of support and encouragement to achieve at a high level. We also have seen firsthand the value of one on one mentoring tailored to the individual student. To this end our Pathways for LIFE initiative provides our students with both a communal environment where they can be challenged and encouraged through team collaboration and constructive feedback as well as one on one mentoring with some of our industries top leaders. We are currently piloting fellowship and mentoring experiences for 5 students with plans to expand to 10 by end of 2018. As part of each pathway students are paired with an industry mentor, practical experience in their desired field and in some cases a stipend. Beginning in fall of 2018, students will be able to apply for our 2019 pathways via lifeartsinc.org. Until two months ago, Daniel Long had never heard of the most legendary pitcher in Cardinals history. Even though the north St. Louis County teenager grew up a short drive from Busch Stadium, he didn’t know until recently how much he would identify with Hall of Famer Bob Gibson. In sports, a player who consistently puts forth maximum effort is referred to as a "gamer". Whether it came to pitching, hitting or fielding, Bob Gibson did it all-and did it extremely well! A Maryville University music therapy partnership uses music to bring relief to children whose daily experience includes a range of traumas involving poverty and violence. Brian Owens (center), the Des Lee Community Music Artist in Residence, was instrumental in connecting Take 6 with a crowd of young singers at the Blanche M. Touhill Performing Arts Center in October. © 2018 LIFE Arts, Inc. | All Rights Reserved.